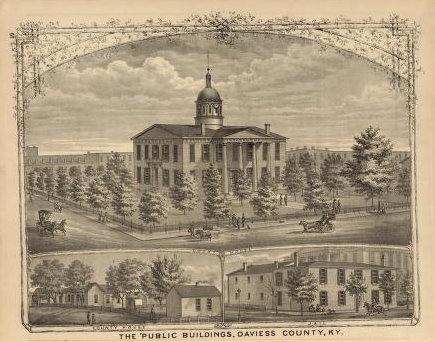 Daviess County Courthouse - Owensboro, Ky.
Daviess County was established in 1815 from portions of Ohio County and is named for the lawyer who unsuccessfully prosecuted Vice President Aaron Burr for treason. Strong southern ties made Daviess County a southern hotbed. According to the Kentucky Almanac, Lincoln only received seven votes in the election of 1860. A large confederate monument stands on the courthouse lawn. Confederate Monument - Owensboro, Ky.
Owensboro, originally Owensborough, is an interesting town. Though its cut off from Interstate access, its still the fourth largest city in the Commonwealth. Its location along the Ohio River spurred its early growth, along with the booming tobacco industry in the Green River region and its bourbon production following the distillery boom of the 1880. Owensboro functioned as a manufacturing hub until the 1970s. On a more personal level, my wife's family is from this area, and any visitor to Owensboro owes it to themselves to try the barbecue: Moonlite for the experience, Old Hickory for the quality. This is the fifth courthouse to occupy the site. All the previous courthouses were quite interesting, the third one having been burned by Confederate troops in retribution for black Union soldiers utilizing the building as barracks. The fourth courthouse was Italianate with a huge cupola on top, but it was condemned and removed in 1927. It was also reportedly haunted. This fifth courthouse was built in 1963, after nearly 25 years of attempting to obtain funding for its construction. In 1989, a Judicial Center was also opened.